Your garden can thrive if you make your own compost and use it as fertilizer, and the good news is that this activity can reduce the amount of trash thrown in landfills, thus reducing the pollution generated in this manner. 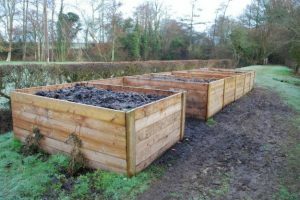 If you want to learn how to make a compost bin, here are some useful tips that will help you out. Before starting, you will need to find a place for your compost bin. Choose one with a lid if you don’t want to deal with the strong smell produced by the decomposing compost. Also, it is vital to pick a spot where the decomposing process can happen at a faster rate. A place exposed to sun rays for at least several hours a day is ideal for such a purpose. Your compost will develop at a faster rate, and you will manage to start using it. Another thing that you must remember is that you need to water the compost bin only enough to keep it moist. This will be an excellent strategy to make your compost bin work the intended way, for maximum results. Your compost should contain equal parts of green and brown waste so that you can ensure proper fertilization for your garden. The way to go is by collecting waste from your kitchen and your garden. 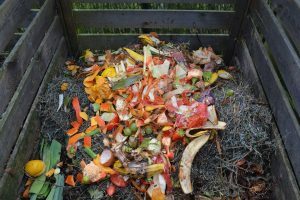 Green waste comes from fruits and vegetables, while brown waste comes from wood shavings, fallen leaves, and other similar compounds. The brown waste will provide the compost with the much-needed carbon for breaking it down through the action of microorganisms that use carbon for this process, while the green waste will supply the nitrogen, an essential building block for soil fertilizer. The key to having good quality compost is to provide the pile with oxygen. That means that your compost bin needs airing on a regular basis. You don’t want the waste you collect inside to go bad; if the compost rots, it will smell bad. The typical smell of compost should be of earthy dirt. It is essential to avoid using parts from animals, not even bones. The same thing goes for dairy. The decomposing fat from animal products will draw pests, and that will make your compost impossible to use. Also, bear in mind to stay clear of plants that died because of insects and other pests. They will contaminate your entire compost bin. Finding the right way to make compost is not an exact science, and it may take a while to get it right. If no transformations are visible, even after a few weeks, add more green waste. If it is too wet and the smell is too much, get more brown waste. If you’re using dead branches, use a gardening knife to break them into smaller pieces, or move them around with a fork, to allow proper airing. We talked about the importance of airing your compost bin. This operation should take place once every few weeks, and it is recommended to use a tool such as a shovel or a fork. The idea is to have the compost turn so that all its parts are properly aired. Air contains oxygen and oxygen helps the compost to decompose and turn into soil that you can later use for your garden. You might not have enough confidence in your first compost bin, so here is another idea that will help you start on the right foot. Use activators that will make the decomposing process begin faster. Waste such as comfrey leaves, weeds, grass clippings, and rotted manure from chickens can serve as excellent activators, and they will ensure the success of your first compost bin. This way, you will have fertilized soil for your garden sooner than you think.